We say these phrases to ourselves many times! As a human being, we are too afraid to try and it is a normal tendency. Do you know that failure is the first step towards success? If all the great minds started fearing and quitting, they would never reach where they are! Life is about taking risks and never thinking about the outcome. Why do we plan and plot our actions? Why can’t we take risks and see what our future holds for us? When we think too much about the outcome, we miss the opportunity that knocks on our door. Let us take a small example of trying river rafting! You might be scared of water and you think you cannot do it. Your friends try to convince you that it will be okay but you are too scared of trying it. So, you stay back in the resort and wait for your friends to come back and they have a great time. They come back alive and also have succeeded to create memories of a lifetime. There are bigger issues in life and this is just to explain you that the fear is irrelevant. It is there but you should not let it cause any hindrance in your day to day life. We really need to sit down and think about our life. Why do we settle for less? It is because we fear that the outcome would not be as per our heart’s wish. Bidding adieu to fear of failure is important to succeed in life. What if you fail? That’s your first thought, no? My question is – What if you succeed? Life is about taking risks and never thinking too much about the outcome. If all our actions become so calculative, we would never be able to cease the day! Failure is the First Step Towards Success – Give it a Shot! What if it really works out? Let us take the example of a relationship. We think too much about the future and fear that our man/woman may not commit to us. We ruin our present when we think too much about the future. You have to give it a try to actually see whether it brings joy to your life or not. People must have faith in their dreams, relationships and actions. If you do not believe in these, you will never be able to succeed. Even in a relationship, you must have patience and faith in your partner in order to reach the destination. 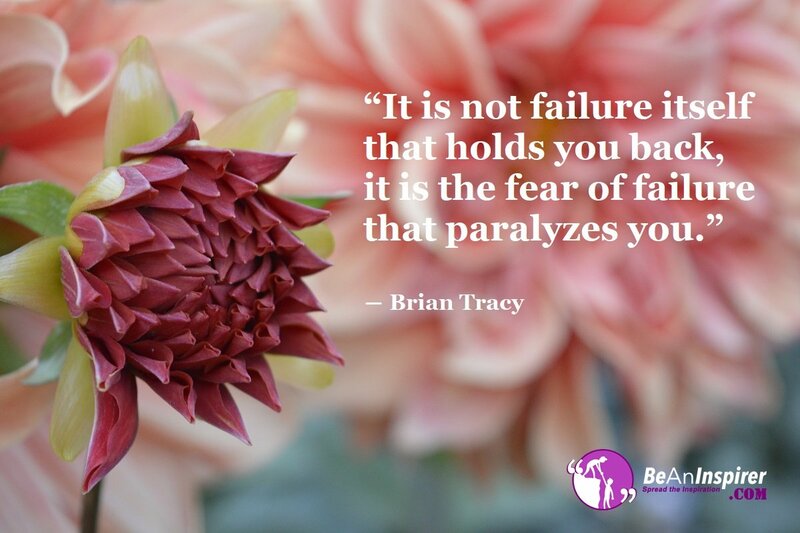 Forcing it out of the fear of failure, you might lose something forever. What if you give it a chance and wait? It might lead to marriage or a beautiful union. The fear of failure is a serious block in your life! You must bid adieu to these feelings and chase your dreams. Give it time and have faith because these two ingredients are important for being successful. Also, you would need to work hard. Not trying is worse than attempting it and failing. Just so you know, failure is the first step towards success. Always know that life is about taking risks and if you do not take them, you would never find out whether you would have succeeded or failed. Give it your best shot and put your best foot forward! With little baby steps and faith, you will reach your destination!